Target audience: Nonprofits, brands, educators, foundations, NGOs, cause & community organizations, Web publishers, individuals. Updated Jan. 19, 2011. The following guide, originally created by TechSoup Global, has been significantly updated and expanded by J.D. Lasica and Kim Bale of Socialbrite. More and more nonprofits, businesses and entrepreneurs are turning to Web conferencing services to communicate with fellow staff members, customers, supporters and prospects. A Web conference is a virtual meeting you conduct online, allowing you to share documents and applications from your computer with people in far-flung locations and to communicate with them via video, text or voice chat. Through Web conferencing, you can bring together employees to collaborate on a project, present webinars about your latest product or services, or train advocates or support staff. While your organization likely uses email or conference calls for much of your long-distance communication, sometimes a full-blown virtual meeting is the only way to hammer out the details of an important initiative. Web conferencing lets anyone with an Internet connection and a Web browser meet and collaborate online in real time. Some conferencing tools require participants to install a piece of software on their own computers before they can participate; other tools are entirely Web-based. All require an Internet connection. The tools differ in the features they provide for collaboration and communication. For instance, some let participants speak to one another through their computers’ microphones while others let everyone interact via video. Still others have an option to join the audio part of the conference by a separate audio/telephone bridge. To help you choose a service that suits your nonprofit, we’ve pointed out features commonly found in Web conferencing products and explained other considerations you should be aware of. Our list leaves out tools like Skype and Apple’s iChat, which offer great video conferencing (video chat) and text chat for a limited number of people but don’t offer full-on Web conferencing services that offer a wide range of collaboration capabilities. When considering all of these great features, it’s important to consider how these capabilities will affect your Local Area Network (LAN). For example, many of the products below include videoconferencing. 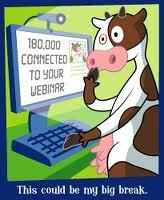 One person using hosted videoconferencing at a location wouldn’t add to much to local network issues. Multiple workers videoconferencing at the same time could slow the rest of your network traffic. Whenever possible, try out the product before purchasing. Use the information below and on product websites to narrow your choices, then try the two or three products that best fit your needs. Here is our comparison of 14 top Web conferencing services. If you have your own favorites, or have any updates or corrections, please share them in the comments! 1We used Watchitoo during Personal Democracy Forum and the midterm elections and were impressed with its rich collaboration feature set. 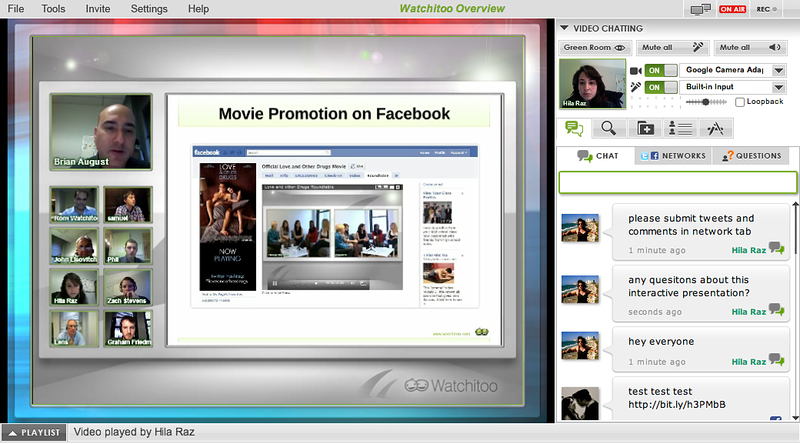 Watchitoo is a real-time collaboration platform where multimedia presentations meld with video conferencing to create a powerful stage for online communication. Its technology lets you easily host and participate in cutting-edge presentations that support multiple video feeds, screen sharing, white-boarding, API implementation, embedding capabilities and recording functionalities that enhance employee communication and collaboration. Software required: Web-based, no download required. Invitation tools: Multiple embed locations, internal email invitations. Collaboration tools: Screen sharing, up to 25 presenters while simultaneously playing any form of rich media, text chat, questions, Twitter & Facebook posting, mobile access, videoconferencing, video editing, whiteboard. Polling & survey: Coming in the next 75 days. Pricing: Free up to 5 people; up to 25 people for $39/month plan; up to 50 people for $49/month plan with a larger storage capacity. Bottom line: A cutting-edge service for collaborating around rich-media projects. Includes some capabilities not found elsewhere. One hiccup: a slight time lag in VoIP conversations. 2Infinite Conferencing, an Onstream Media company, specializes in phone and Web conferencing solutions, webinars and webcasting. It delivers feature-rich solutions that range from on-demand conferencing to full-scale, online event management. Invitees need only an Internet-connected computer and phone line to participate in a Web conference. Infinite has a nonprofit program that offers discounted rates to charities, religious organizations, foundations, educational institutions and membership and scientific associations. Clients include the American Hospital Association, the Leukemia & Lymphoma Society, Dell, Sony, Disney — more than 5,000 customers in all. Software required: Web-based; no software downloads needed. Invitation tools: Registration tool lets you create a customized e-vite and registration page. In addition, the system sends automated confirmation and reminder emails. Integrated with Microsoft Outlook. Collaboration tools: Web conferencing, teleseminars, webcasting via webcams, webinars, phone conferencing, VoIP and a suite of Pro services. Not currently compatible with mobile devices. Recording: Yes. You can record the session via an on-demand recording feature at $1.99 per minute, or a member of the Infinite team can capture the recording for you for $200. Polling & survey: Yes. The polling feature is available throughout a Web session. Infinite can create a customized survey that pops up following your webinar and can also be sent out via a url for $100. Post-meeting reports: Yes. Following the session, you’ll receive an email that lists each participant’s name, company, email address and duration of connection. In addition, the report will feature all of your polling results if the feature is used.